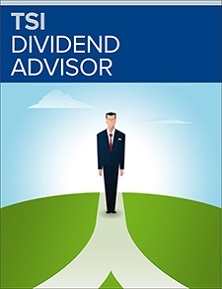 A new advisory—TSI Dividend Advisor—launches a powerful rating system that can help assure your financial future with dividend stocks. Whatever success you have had with dividend stocks, you can now expect to have much more. We have developed a powerful new proprietary rating system that will help you unlock the full power of dividend stocks. Our ratings scale will help you answer this all-important question about the stocks you invest in: will they keep on paying, and raising, their dividends? A company that continues to pay and increase its dividend will have growing sales and earnings, sound management, a strong position within its industry and, often, hidden assets waiting to be unlocked. These are the stocks that will keep on rewarding investors like you. You will find these ratings only in our new advisory, TSI Dividend Advisor. Here is how they could unlock even greater profits for you. TSI’s Dividend Sustainability Ratings are new, but they’re based on the more than four decades I have spent in investing and on the many years of experience accumulated by my fellow analysts at TSI Network. Save $200.00 when you subscribe to TSI Dividend Advisor and let our unique Dividend Sustainability Ratings work for you. You can build a dynamic portfolio composed entirely of dividend stocks. You can have more aggressive growth stocks as well as conservative stocks. You can have stocks from across the five economic sectors. The right choices are much easier to make with our Dividend Sustainability Ratings. A long-term record of dividend payment: 2 points. This is the prime measure of strength and stability. With weak or troubled firms, the dividend is often the first thing to be discarded, if it was ever paid at all. We assess these points by tracing a company’s dividend record over the past 10 years. A recent dividend increase: 2 points. There are good reasons companies trumpet their dividend hikes. They are more than a reward to shareholders, they’re a statement of self-confidence by the company. We trace increases over 5 years, to get a timely reading on the company’s commitment to dividend increases. Management’s public commitment to a dividend: 1 point. A company’s commitment to the dividend is reinforced if management stands behind it publicly. Executives don’t like to be called out by the media or shareholders for failing to keep their word. Being in a non-cyclical industry: 1 point. TSI Dividend Advisor will include stocks in the Resource and Manufacturing sectors. But all experienced investors know that stocks in these sectors are more likely to reduce their dividends when the economic cycle is against them. So stocks in more consistently stable sectors get an extra point. Limited exposure to exchange rate/political risk: 1 point. All companies with international operations will suffer to some degree from exchange rates. This is especially true of U.S. multinationals, who can lose revenue to a strong U.S. dollar. But this is usually offset by their volume of sales, and rarely affects their dividends. Political risk is a greater danger. You will find few if any stocks in this advisory that subject a substantial part of their businesses to the hazards of politically unstable nations or predatory governments. An attractive balance sheet: 2 points. To pay dividends, a company must be able to count on a reliable source of revenue, so we insist on a strong balance sheet with a manageable level of debt. How a company spends its money is important, too. Acquisitions can be good, for instance, but too many of them can take a bite out of a company’s cash and push the debt load to uncomfortable levels. A record of earnings and cash flow: 2 points. A consistently strong balance sheet can only be maintained with a regular stream of revenue and earnings to generate steady cash flow. Industry prominence: 1 point. Companies that anticipate advances in their industry, adjust to changing conditions and technology and withstand strong competition also have the confidence to pay dividends year after year. With our ratings, you can see at a glance just how likely it is that a stock you own will keep on paying you a dividend. And by extension, just how long this company is likely to be successful on all fronts. You can trust these ratings. As a research organization with a long history of assessing stocks for our subscribers and our wealth management clients, we know what to look for. We put our experience and knowledge to work sifting through the thousands of dividend paying stocks on the North American markets on your behalf. What’s more, we have made it easy for you to decide where a particular dividend stock will fit in your investment portfolio. In TSI Dividend Advisor, you get our guidance on how to select dividend stocks for your portfolio. We give you four portfolios that sort these stocks from the most conservative to the more aggressive. Occasionally, stocks will fall into more than one of our portfolios. That simply gives you a little more information on how it may fit into your personal portfolio. The stocks in this portfolio have paid dividends for years, and have regularly raised these dividends (each of them has raised its dividend for at least the past 10 years). Thus, these stocks have a history of providing investors with steady income in dividends. You could also expect capital gains, in part because the strength of the dividends attracts investors. This portfolio contains well-established stocks that have shown a pattern of steady revenue and earnings over the years (for instance, it has the highest concentration of consumer stocks among these portfolios). That makes them reliable dividend payers, and also means investors can generally look forward to routine growth in capital gains as well. In this portfolio you will find stocks that enjoy rising share prices as well as significant growth spurts. For the most part, these stocks have a growing market share or even a unique niche within their industries that helps to propel strong growth. Because they pay steady dividends as well they can offer an attractive combination of income and rising capital gains. Stocks in cyclical industries see their share prices fluctuate as the industry advances or recedes. The best of them stand to rise significantly with recovery in their industries—and reward investors with dividends that grow steadily in all markets. In this portfolio, you also get our top choices among Real Estate Investment Trusts (REITs) and income trusts. Selecting stocks from these four groupings, you can build a portfolio that is right for your needs, right for the changeable markets ahead and, best of all, ideally suited for building wealth for years to come. When you see this new and unique approach, I think you’ll agree it’s unlike anything Canadian investors have been offered in the past. I invite you to try TSI Dividend Advisor. You will be billed just $97 for the next 12 issues—one full year—of TSI Dividend Advisor. You save $200.00 off the regular annual rate. Good companies will do everything they can to keep their dividends secure, and raise them whenever they can. They will rely on rising revenue and earnings, so you can usually count on rising capital gains as well over time. You’ve likely done well with some dividend stocks. Now you can do even better. You can build a more powerful portfolio based on a selection of elite dividend stocks. We tell you which stocks are good for buying now. We also point out dividend stocks we think investors should avoid. These are often stocks whose dividend yields appear attractive but may also carry risks that could make it difficult to sustain a high dividend. Boston Pizza, for instance, has consistently offered a high yield. Yet it is a royalty trust, which means it owns the trademark but none of the other assets that produce its income (nor does the trust have the right to any future trademarks). We prefer companies with a strong business plan and control over the assets they depend upon for revenue, earnings and cash flow. Ten Peaks Coffee is a stock that has many appealing aspects: a history of earnings, low debt and a good yield. But demand for the company’s specialty, decaffeinated coffee, is starting to wane. And the level of competition from coffee and other beverage producers is rising. Plus a company that relies on three customers for 40% of its sales has added risk. With our Dividend Sustainability Ratings, you get insights and advice you won’t find anywhere else. You should not miss this opportunity to profit from our exclusive ratings. Take advantage of this special introductory offer. When you accept this offer you receive a full digital subscription to TSI Dividend Advisor which also includes your weekly Email Hotlines with my latest updates and recommendations on the dividend stocks we follow for you. You are fully protected by my unconditional guarantee. You may cancel at any time and receive a full refund on the unused portion of your subscription. You have no risk. This may be the most important investing decision you make this year. With our detailed insights and unprecedented ratings on dividend stocks, you can give yourself a tremendous advantage in today’s markets. I look forward to hearing from you and helping you succeed with your investments.